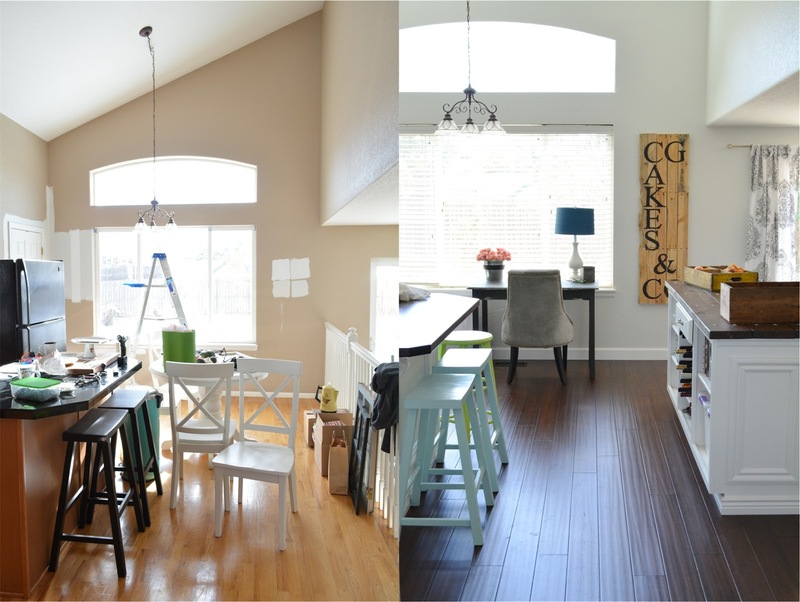 It's been nine months since I posted the first of my "Before and After" series of the work we've done on our home, the first being the renovations in our living room. And finally, finally, our kitchen is finished, too, and I'm so excited to continue the series. 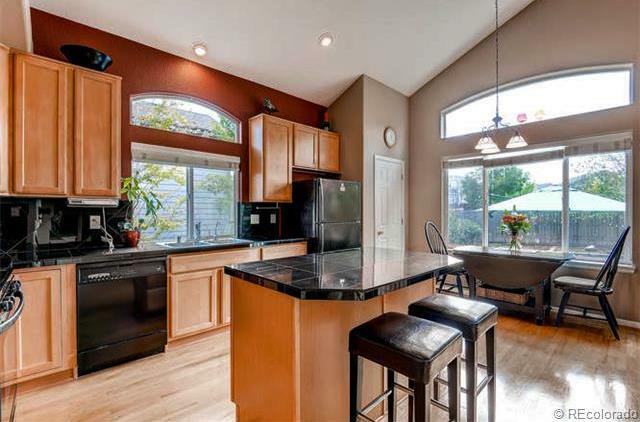 When we bought our house a year and a half ago, I could see that the kitchen had good potential, and was a great size, but the style was just so not me. My Pinterest board is full of pretty white kitchens that welcome you in, and this one did the opposite for me. 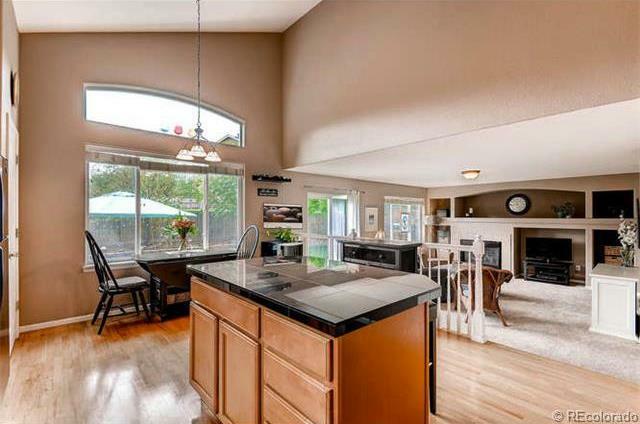 Here are the photos from the real estate listing. 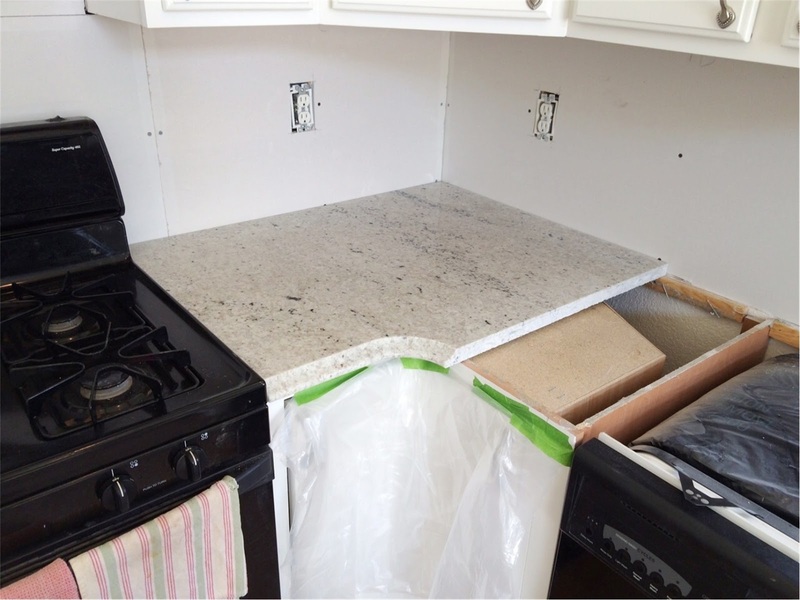 The black granite tile was not only masculine and depressing, but the grout trapped all the crumbs on the island and was impossible to keep clean. Tan walls throughout the whole house. 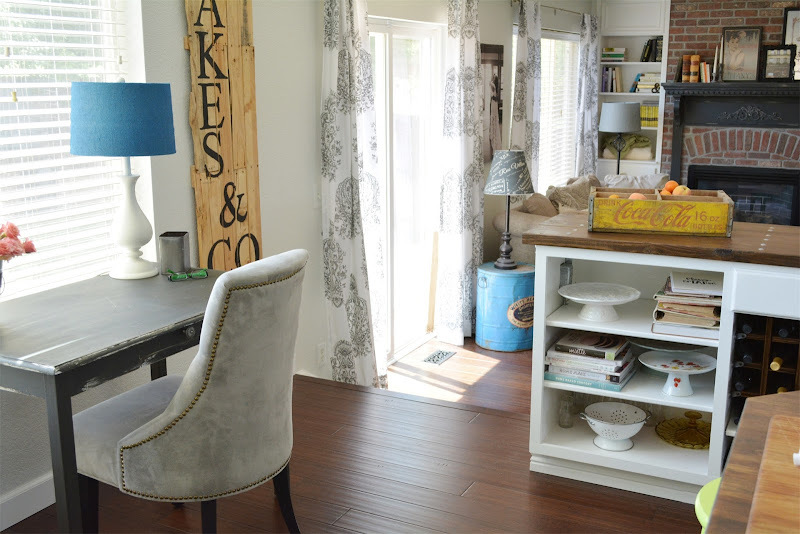 Orange, builder-grade oak cabinets and a chintzy looking island. After we moved in, it looked like this for a while. We closed on the house just a couple weeks before Christmas in 2014, and then spent our Christmas vacation painting the entire interior. 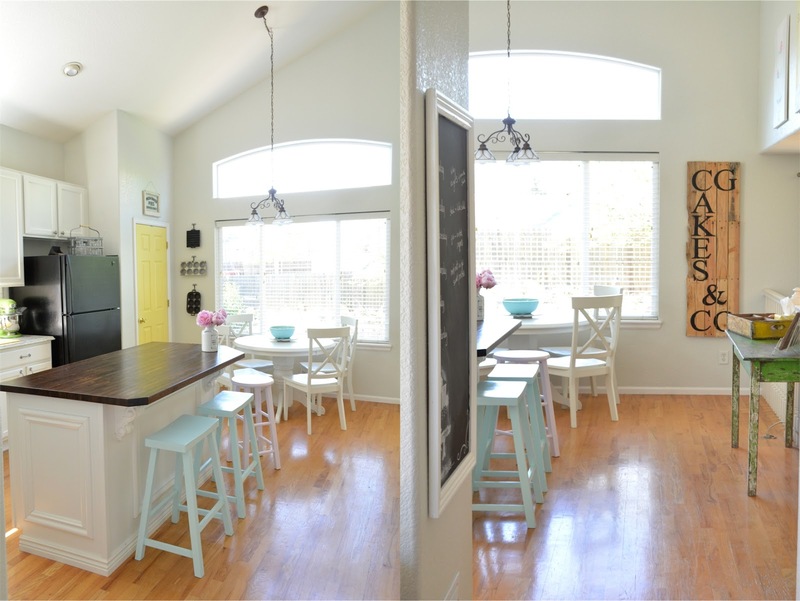 Paint is one of the least expensive changes that we could make that would have the biggest impact. We painted over all that tan with a light gray called Gray Palisade throughout most of the house, with a few other shades of gray here and there. Even the yellowed interior doors and every bit of trim got a scrubbing and a fresh coat of white paint called Swiss Coffee. Imagine the time and commitment it takes two people to paint a whole house. We were exhausted. 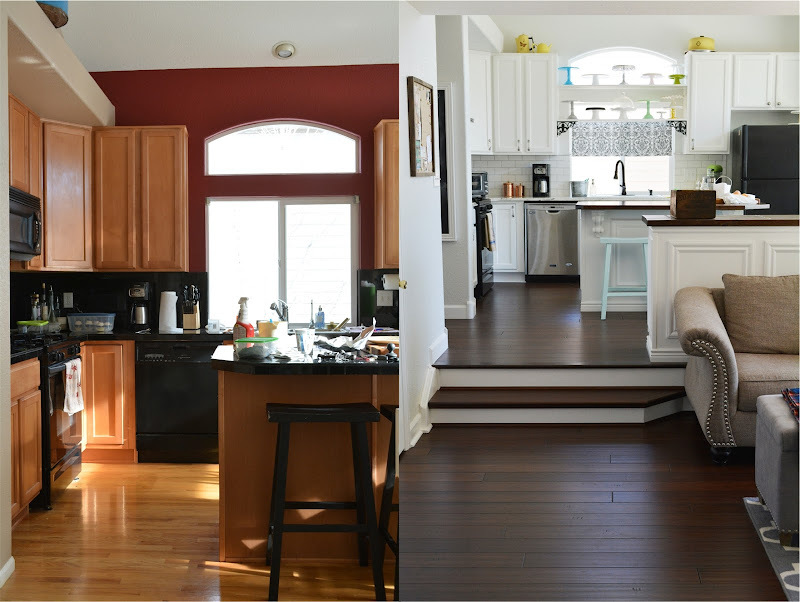 Here's a little side-by-side of the kitchen when we moved in, and what it looks like today. Quite a change, isn't it? 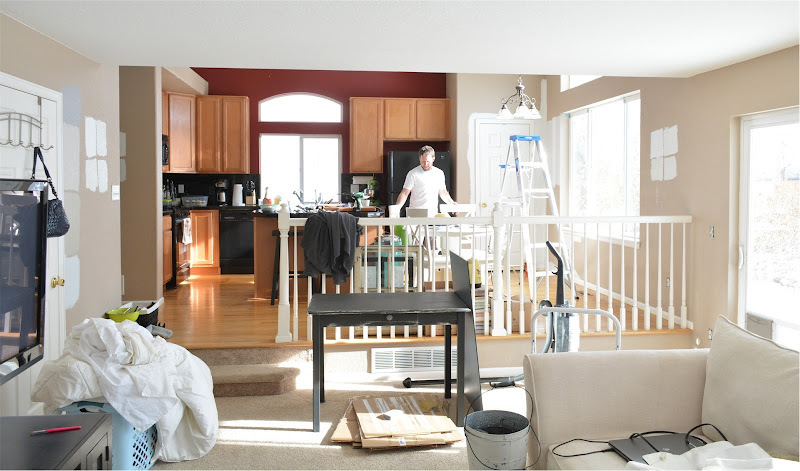 Through all these home improvements, a tight budget has always been forefront in every decision we've made. We do the work ourselves and we salvage and reuse where we can. The first step towards a sunlit white kitchen had to be tackling the cabinets, and that meant more painting, since we were not going to be tearing them out and buying new cabinets. 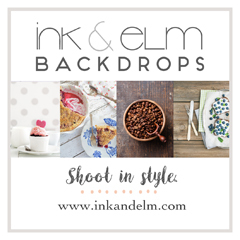 It was a miserable project, and we started on the wrong foot by using Annie Sloan Chalk Paint. 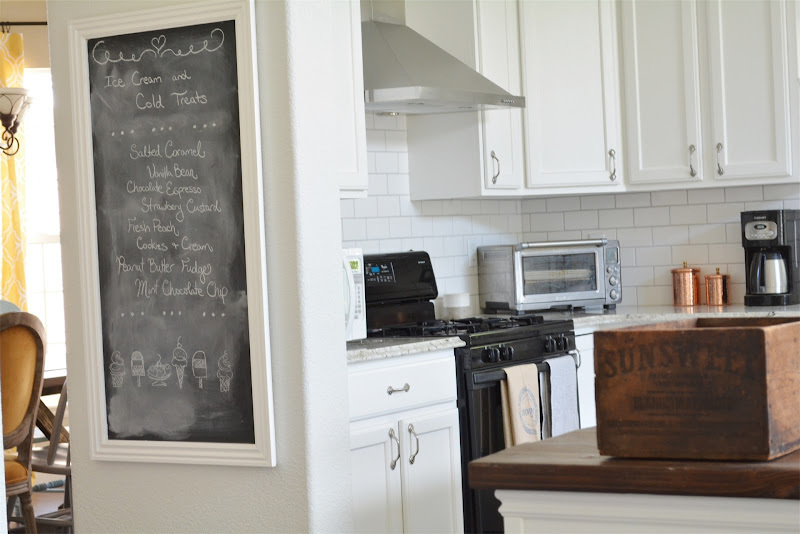 I have used that brand of paint successfully on our living room mantle, which I painted with Graphite, and the result was beautiful, but the white chalk paint simply wouldn't adhere to the cabinets. An hour after painting, and the paint was peeling and flaking off horribly. We sanded them down and tried again, with the same results. At last, I gave up on the idea of chalk paint, sanded them one last time and covered them with primer before painting them with the same semi-gloss paint we used on all the trim. All in all, it took three weeks of sanding, priming and painting, more sanding, more painting, and lastly a few coats of polycrylic so that they could be easily cleaned. Silver hardware dressed them up nicely, too. 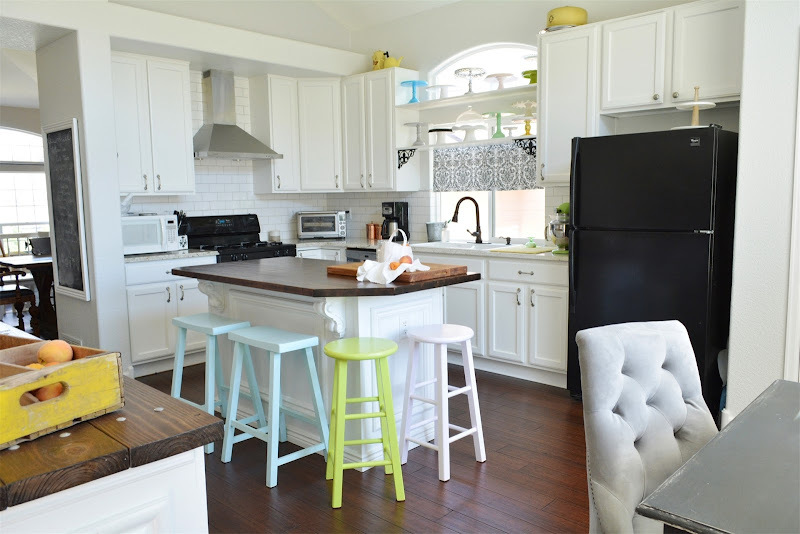 Of course, white cabinets have to be wiped down now and then since splatters show up more easily than on plain wood or dark cabinets, but with the coat of poly, they are easy to keep clean. 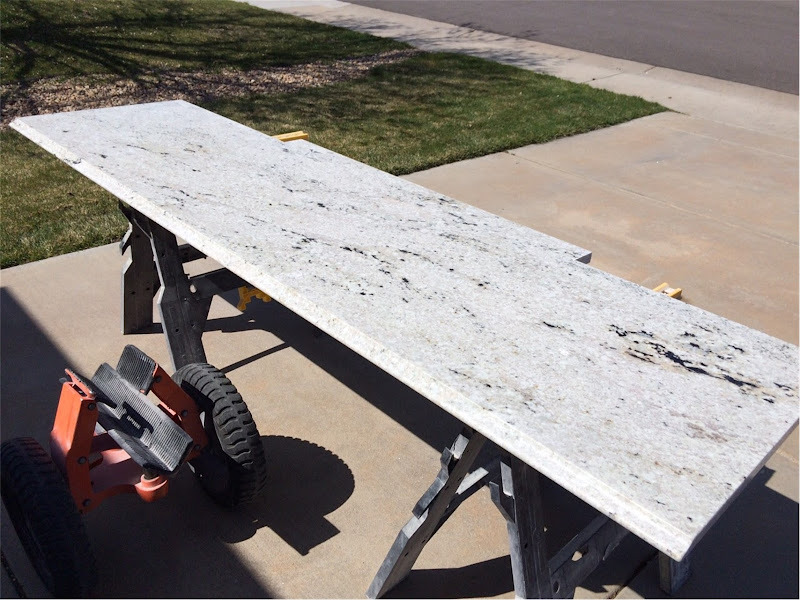 The biggest expense in the kitchen was the new counter, and it was the only thing that we had to have installed for us, since they come on site to measure and cut the massively heavy slab of granite. We visited a local tile and granite supplier where we chose a slab of white granite called Cotton White, although of course it still has flecks of many other colors in it. 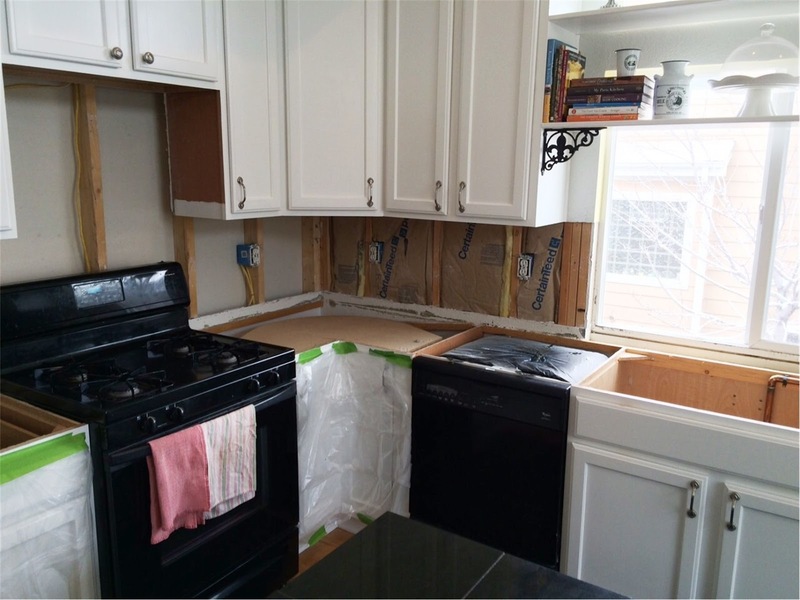 To prep for the counter installation, we first ripped the black tile backsplash off the walls, along with the drywall behind it. 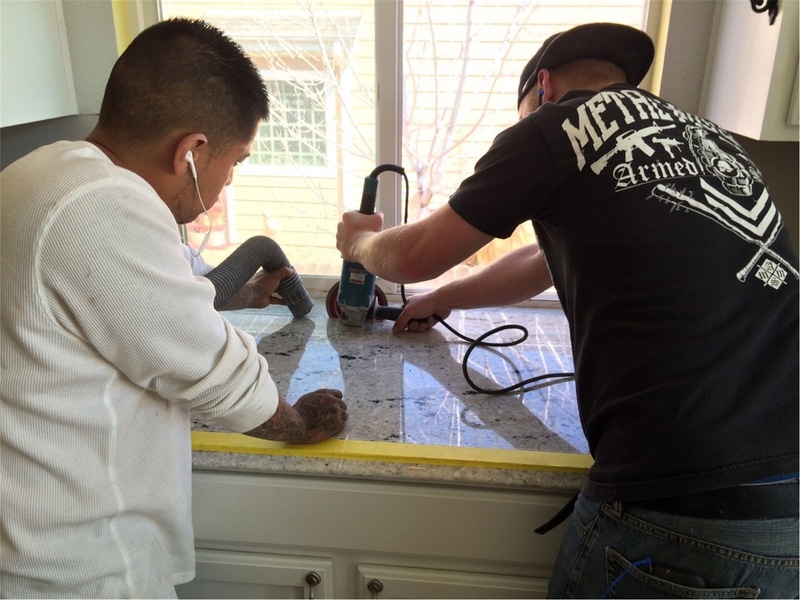 Jamie put up new drywall, and then they arrived to pull up the old tile counter and install the pretty white granite. It already looked so much better! Besides the counter, we also got rid of the old stainless steel sink and replaced it with a white cast-iron sink, made affordable by going with the top-mount option, which I actually prefer to under-mount anyway. A new black iron faucet dressed it all up beautifully. The next project was the backsplash. 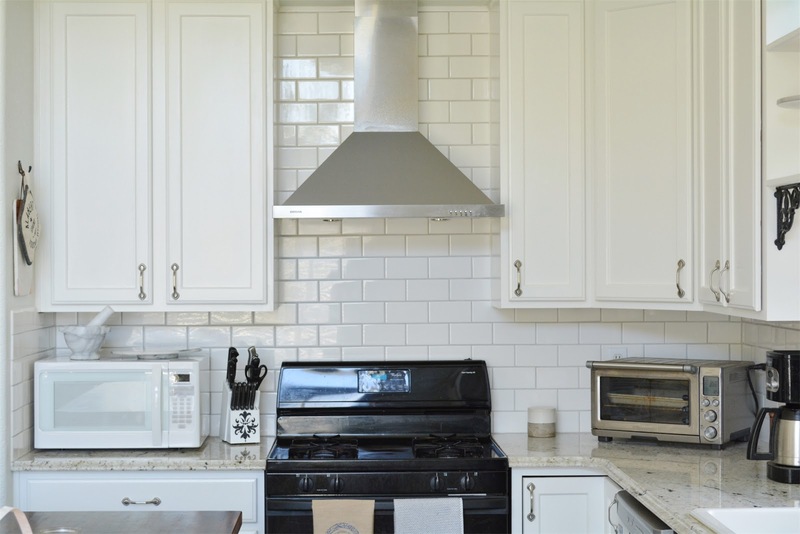 We decided on a classic white subway tile, and it was my first time tiling, but I have to say, I think I did a pretty damn good job - with my husband's tutelage. For a little contrast, we used a light gray grout for the tile. 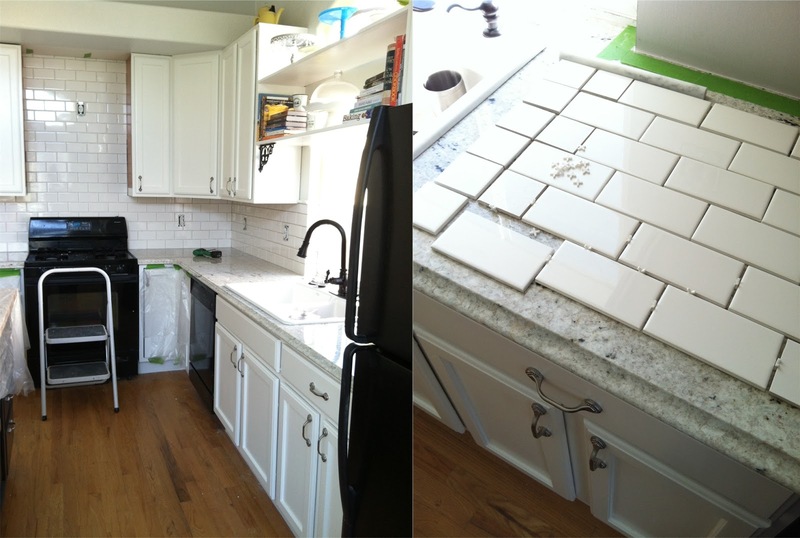 This was definitely a money saving project, since subway tile is very inexpensive, and we used a borrowed tile saw. 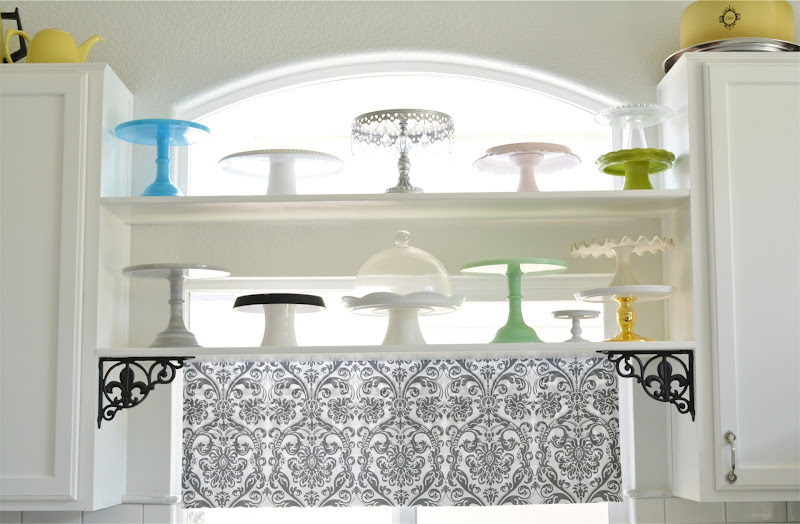 And for my collection of cake stands, Jamie built these two shelves to join the cupboards over the sink. Don't they look so beautiful with the back-lighting from the window? Not forgetting the island, we bought an unfinished piece of walnut which Jamie sanded and rounded the edges, then stained and sealed for a beautiful butcher block counter top. 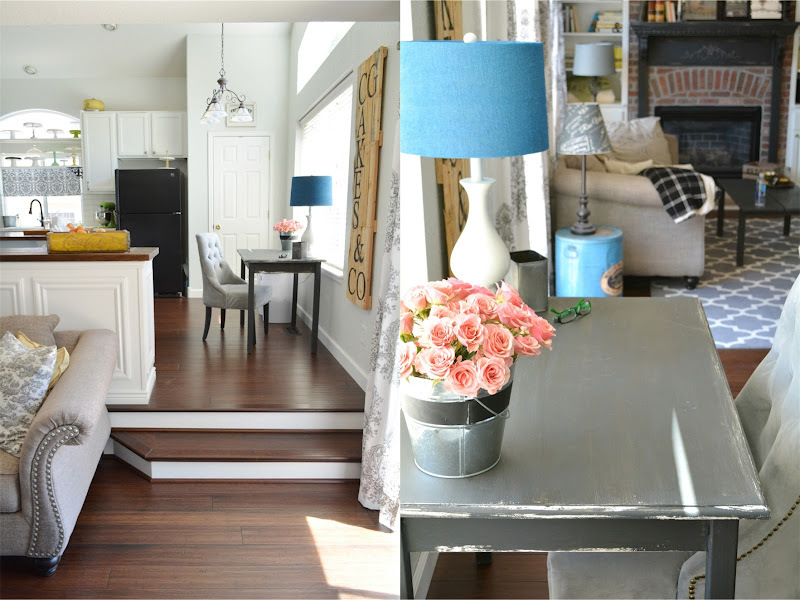 We painted the island and Jamie installed trim and decorative corbels to fancy it up. 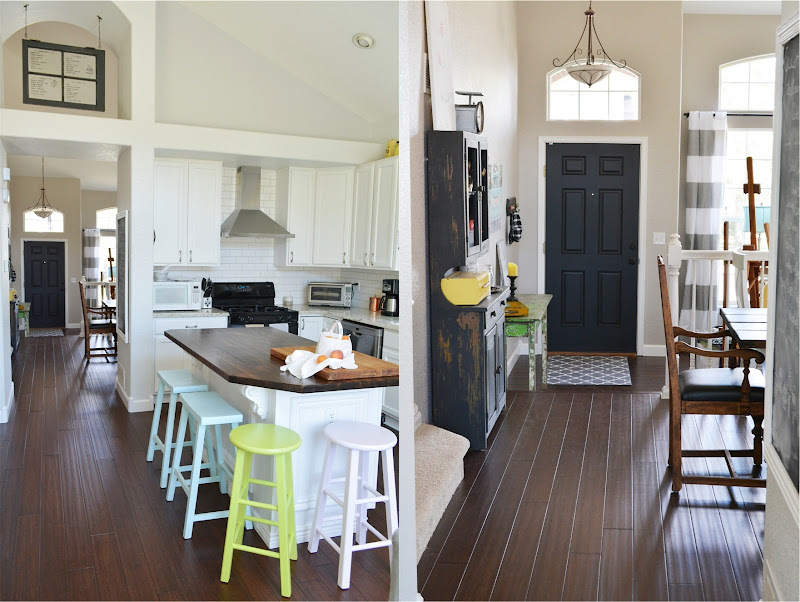 I painted all of our kitchen stools to add splashes of color. We also decided to pull down the microwave and cupboard over the stove and install a self-venting hood instead. 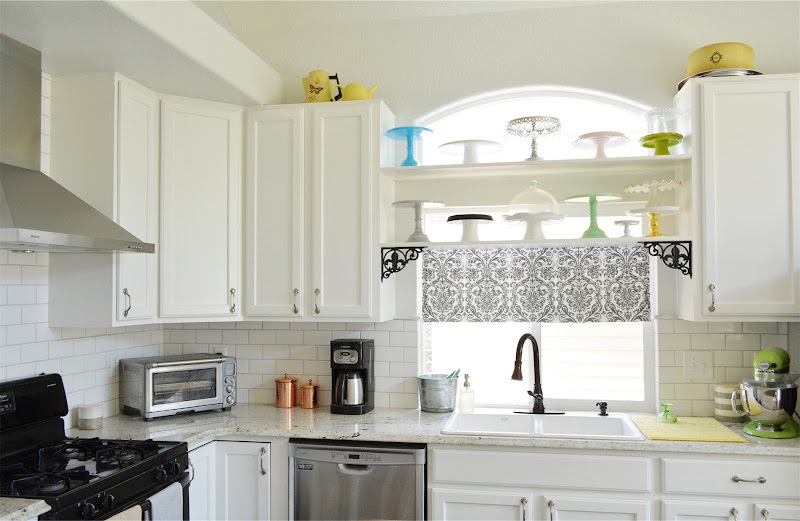 The trade-off, of course, is losing a small bit of cupboard space, as well as now needing to set a microwave on the counter or somewhere else, but I just love how the hood updates the look of the kitchen. The appliances in this house are older, and not really the best, and yet, it simply isn't in the budget to replace them all, so the only one we have replaced so far is the dishwasher, which was too small and ineffective. 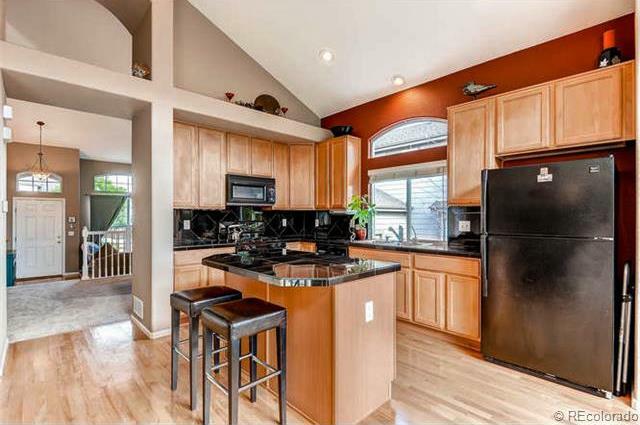 I would eventually like to move the black refrigerator to the garage as a backup and get something new for the kitchen. The gas stove/oven took some getting used to since I'd always had electric before, and the gas oven works unreliably, at best. Always 50-75 degrees off, it makes cake baking a challenge, but I can deal with it. 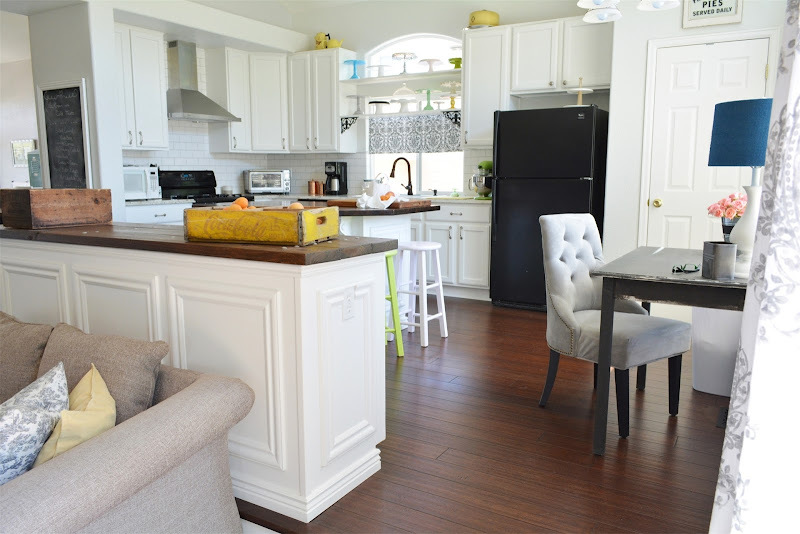 At this point, I was honestly okay with the oak floor in the kitchen, mainly because I was just so tired of all the work, and I thought we should try to keep it if possible. 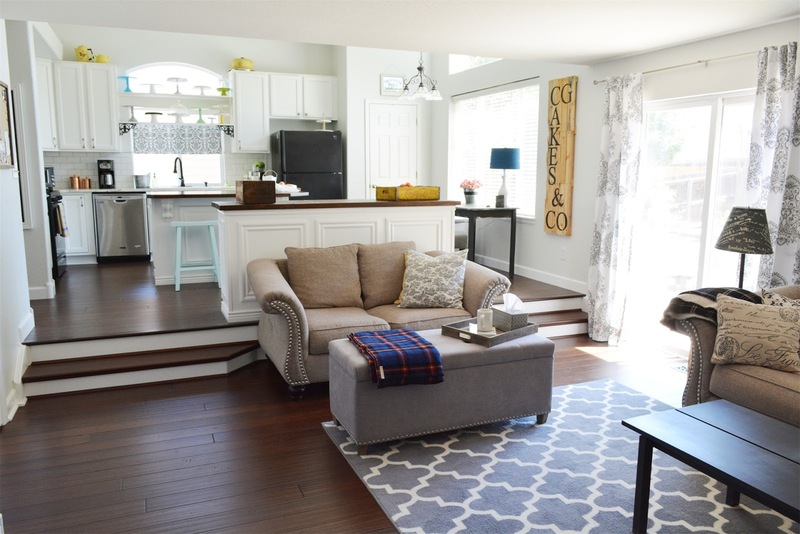 But since we planned on putting down flooring on the whole main level, of course it all had to match. 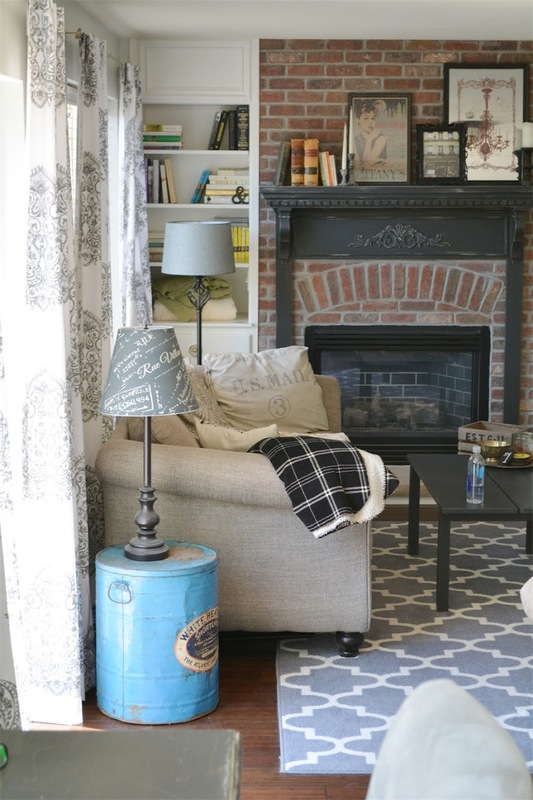 So, the options were, try to match what we had and put that in the living room and front room. 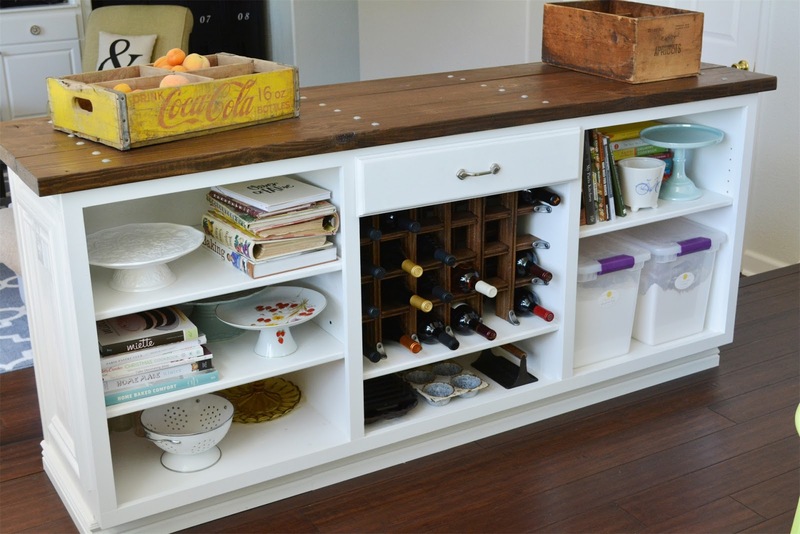 Or, get unfinished wood for the remainder of the main level, sand down the kitchen floor, and stain it all to match. Or, just replace it all. 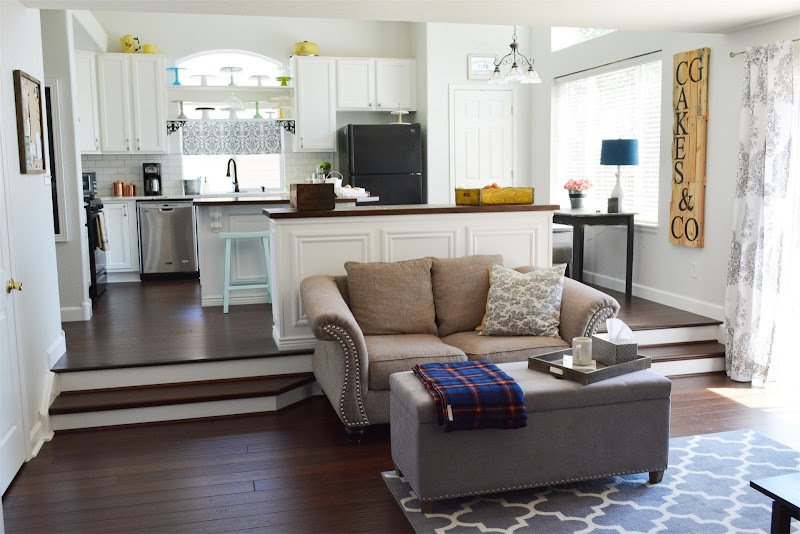 In the end, after weighing the costs of each option, and the labor involved, we decided on new bamboo flooring for everything. I desperately wanted to try to finish it before last Christmas when our family visited, but it was just way too tight of a timeline, so we were only able to complete the living room before Christmas, and the rest had to wait. Another change that we decided to make, which had to happen at the same time we finished the floors, was that railing in the kitchen. Above, you can see how it looked when we moved in. 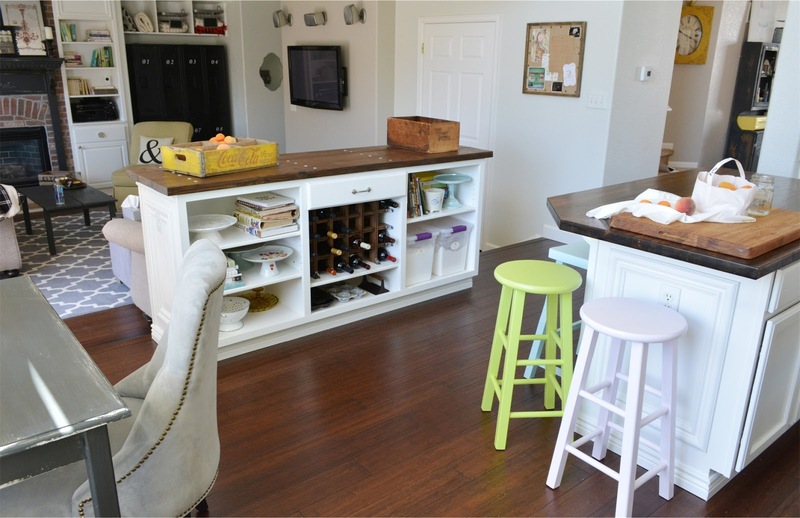 My idea was to take down the railing, build a matching step on the other side, and then build a counter of some sort in the middle to add more storage. This would give two entrances into the kitchen, with one conveniently right next to the patio door leading to the back yard. In the next photo, you can see that at that point we had ripped out the carpet in the living room and put down flooring in that room only, as well as built the second step, and this is where we had to leave things for a few months, until we were able to begin again after the holidays. It was around January or February this year that we got rid of the railing completely and began the demo of the kitchen floor. It was an insanely hard day of work, and I had just found out I was pregnant. All I wanted to do was sleep. At the same time, we had to rip up all the carpet in the dining room and front room, since the wood was going to continue from the kitchen into those rooms. It was dirty, exhausting work, and to finish the kitchen, dining room and front room, it took us a good 3-4 weeks, since we only had weekends to do the work, just to get the flooring cut and installed. Jamie put his portable table saw that I gave him for Christmas to good use. I drew up a sketch of the new counter, or buffet, if you prefer, and Jamie built it completely from scratch, with moveable shelves on either side for cook books, more cake stands, and my bins of flour and powdered sugar, and a wine rack in the middle, which he made from scraps of wood from the original kitchen floor. Impressive, isn't it? 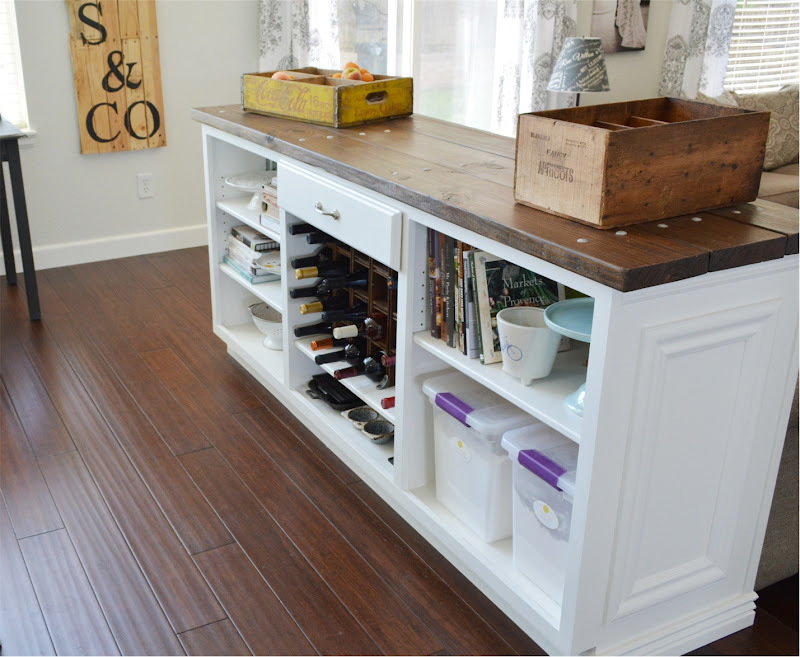 The top is made from inexpensive planks of wood, sanded smooth and stained to match the floors and butcher block island top, finished with heavy-duty carriage bolts. Although there's plenty of room in the kitchen for an eat-in table, we have a big dining room table, so I sold the round white table and four chairs that were in the kitchen (we need the money for baby things), and moved a desk in front of the window instead. I love having a few antiques in the house - although not so much that they take over - like the blue metal shortening can I use as an end-table in the living room, the yellow Coca-Cola box, which holds fruits and vegetables, and the old wooden apricot box that catches any clutter we have sitting around the kitchen. Before we looked at counter options, I had my heart set on white marble. But then I found out the maintenance, and expense!, and realized it simply wasn't going to happen. 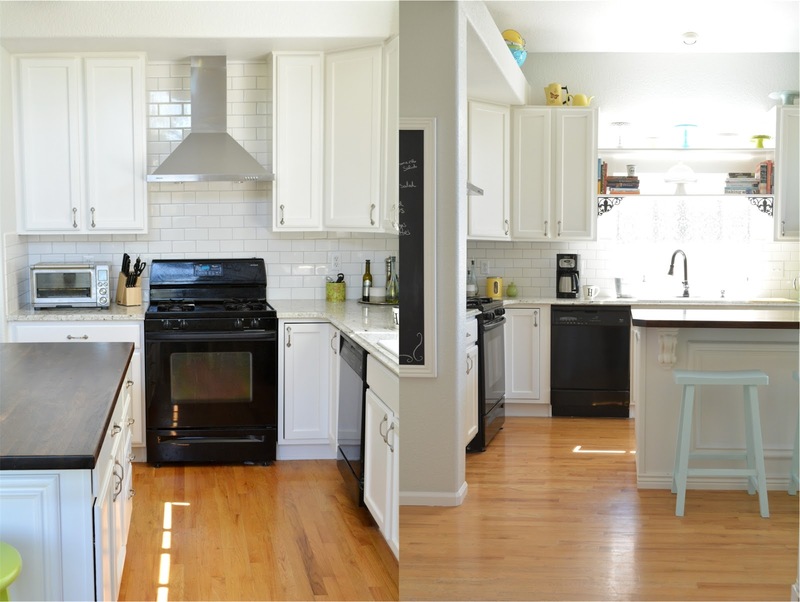 Formica, and other faux options just weren't going to do anything for the resale value of our home, so it came down to granite or quartz, and as you know, we chose granite. Since we couldn't have marble counters, we've found ways to add little hints of marble here and there - a cutting board from Home Goods, the little corner trim pieces at the window over the sink, the mortar and pestle, and my lazy susan for cake decorating.